A precision stepping stage which is mounted on the stage of the microscope, and connected to the PC. The position of the slide on the stage can then be controlled by PETROG. A precision stepping stage which is mounted on the stage of the microscope, and connected to the PC. The position of the slide on the stage can then be controlled by PetrogLite. A digital imaging camera which is mounted on the microscope, and connected to the PC. The image from the camera is displayed in real time in PETROG. The PetrogLite software which provides point counting and SteppingStage control. The PETROG software which provides the integrated platform for data collection, data management, analysis and reporting. 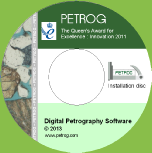 State of the art software for petrographic thin section data capture and analysis. An ultra slim stepping stage for positioning slides on the rotary stage of a polarising microscope - invaluable for digital point counting and other applications. Converts your computer into a digital point counter - the low-cost solution for petrographers in any industry.